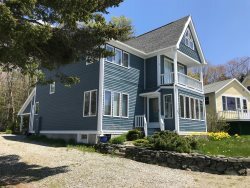 Chamberlain home with small sandy beach! WHAT IS THE ROLE OF Newcastle Vacation Rentals? We act as your Rental Agency – not your property management company. The base commission rate pays for our Main Street office rent and overhead, salaries, print advertising and a few professional memberships (such as the Chamber of Commerce, VRMA, Maine Tourism etc. ), our liability insurance, legal and accounting services, and the cost of maintaining our website. We receive that commission only if we are successful in renting time at your property. This means that if we don’t write a lease for you during the current season we still maintain your advertising on the website, and carry your property’s share of all of the above fixed costs, but without any compensation from you. If we are able to write leases at your property another layer of services kicks in – assisting your renters with their vacation experience. To do this we manage a 24-hour, 7-day-a-week check-in lobby, we develop individualized Cottage Booklets, collect and pay your State Lodging Tax and any other service taxes, respond to maintenance requests or complaints, evaluate departure surveys, manage requests for return visits, and receive and pay out rental receipts and security deposits. We also provide your renters with 24-hour emergency phone coverage and a Linen Rental Service (originally started as a way to reduce cleaning/laundry costs for owners). In addition we manage the turn-over cleanings at a significant number of properties; a service which includes the hiring, supervision and payroll of seasonal employees. Ongoing maintenance, property upkeep, grounds keeping and repair issues that are not of an emergency nature are always the responsibility of the Owner or their designated caretaker. WHEN IS THE BEST TIME TO LIST MY PROPERTY? We prefer to sign on new properties from late summer through early winter – for the following season. In this way our web site can be as complete and accurate as possible before the start of the reservations season. We try to take property photos during the best possible weather. Properties seeking to join after the reservation season is underway may be charged a higher listing fee to cover the increased demand on staff time, or may be deferred until the next season so that we can concentrate on filling vacancies within the current listings of properties. HOW ARE RENTAL RECEIPTS RECEIVED AND DISBURSED? When a reservation is made we prepare the lease contract for the renter to review. When the terms have been accepted, and the contract is signed we require a reservation deposit which represents half of the total rental amount. This initial reservation deposit confirms the booking. Then, approximately 45 days prior to the check-in date we collect all outstanding rent, the State Lodging taxes, Security/Damage Deposits, Non-Refundable Pet Fees and cleaning fees, if applicable. All rental receipts are held at this office in a designated Trust Fund until the rental period has been completed. Owners are generally paid within 5-14 days of the conclusion of the rental period, but not until we have made any disbursements associated with that rental period (appliance services, locksmiths, etc). Payouts may run a bit longer during the busiest weeks of the summer. SHOULD WE HAVE A CARETAKER? If you live locally and are willing to address any ongoing or urgent requests for maintenance then you probably don’t need a caretaker. If, however, you are not readily available during the summer season, or if you leave your property unattended for extended periods of time, or through the winter months, you might want to consider finding a caretaker. Your “caretaker” can be a professional service under contract for specific chores or a local handyman who knows your property (and understands the importance of addressing cottage issues promptly). This individual can also be your eyes on the property – watching out for damage or wear issues that the housekeeper may miss. We can offer you the names of local Caretaking Services and handymen, and you can discuss their fee arrangements directly. How Do We Handle the Cleaning? In signing your contract with us, you agree to prepare your property for renters at the beginning of the season by accepting responsibility for the Opening Cleaning. This includes a thorough cleaning, as well as checking all systems (including smoke and carbon monoxide detectors) setting docks, bringing out any seasonal furniture or equipment, removing storm windows, cleaning grills, washing all bedding and having all systems on and ready. Turn-over Cleaning takes place immediately after a renter departs, and is either billed to the renter (if NVR arranges for the cleaning) or paid for by the Owner (if the owner has their own housekeeper or has requested a cleaning from NVR following a private rental or family use). Owners are welcomed to have their own cleaners - and we generally find that properties are better cared for when the owners’ housekeeper handles the work. You will be asked to specify your cleaning instructions when you sign your listing contract – indicating whether you want to manage your own cleanings, or will need for NVR to make these arrangements for you. These instructions let us know if we need to add a cleaning fee to leases written on your property. Our estimated cleaning fee charged to a renter is based on our best estimate of what an average turn-over cleaning at your property should run. When a renter departs, cleaners will expect to find the property “broom-clean and tidy” with beds stripped, refrigerators empty, and all trash removed. They have a cleaning task list that includes a disinfecting cleaning of bathrooms and kitchen surfaces, wiping down refrigerators (they rarely have time to defrost), wiping down stove tops (but are unlikely to have time to clean a soiled oven). They will vacuum, dust, and mop kitchen & bath floors. They generally do not have time to wipe porch furniture or sweep decks. They do not unload clean dishwashers, clean grills, wash windows or blinds or remove trash. They will not have time to water flower boxes, make up beds, check light bulbs or smoke alarm batteries. Please remember that our Cleaners are caring for several properties on any given turn-over date. What are the Renters’ Responsibilities? Renters are given detailed instructions in their Lease Cover Letter and on their Check-list for Departure Mornings. Their lease and contract packets also contain specific instructions about acceptable behavior while in residence. For instance, we want them to remove their trash and recyclables from the house – and from the property if necessary. We expect them to honor the Guidelines for Pets - if they have been given permission to bring a pet. We expect them to honor the check-in and check-out times, and we expect cleaners, owners or caretakers to notify us immediately if renters arrive too early or stay too late. Renters are prohibited from smoking in any property. They are also prohibited from building campfires unless you have a clearly defined area. They are prohibited from having large gatherings of local friends or family members unless you have given permission, but we need to be flexible enough to allow them to have a reasonable number of friends/family over for limited visits. What do I need to do to prepare my house for rentals? Owners need to be committed to having their cottages thoroughly cleaned and ready for vacationers at the start of each summer. We expect you to honor the list of amenities that you approved (on your Data Sheet) – and to replace any item listed that is no longer functioning. Bed sizes must be verified. Phone numbers must be verified. Please remove liquor or lock up your cabinet. Please empty (or nearly empty) your refrigerator and freezer (Your condiments can be stored on the bottom shelf, pushed to the back). Please be sure there is enough space in cabinets for your guests’ food. Please make dresser drawers and closets available. Remove all of your personal bathroom items. Examine your bedding carefully… and ask yourself if you would be comfortable using this bedding at the Holiday Inn? Replace your pillows frequently. Replace mattress pads annually. Be sure your bedspreads and blankets are washable, and that there are spares in the closet. Pack away your clutter; pitch old magazines and pamphlets, replace cookware with flaking Teflon surfaces. Look critically at porches, railings, stairs, decks, docks, etc. Is there anything that is in need of repair, and that could potentially cause an injury? Do you have working Smoke Alarms? Carbon Monoxide Detectors? Fire extinguishers? Flashlights? We also need owners to leave an adequate stash of cleaning supplies at the start of the season. This helps your renters be better tenants, and saves cleaners from having to dash out to buy supplies – or resort to simply wiping down surfaces with water. The better equipped your cottage is, the better cared for it will be. Scrimping on mops, cleaning supplies or vacuum cleaners is only shortchanging yourself and your property; and is a sure way to invite complaints from renters and cleaners.